I thought Rimmel's London Clouds (from their Lasting Finish line) would look just like Tipp-ex on my nails, I actually never considered using it on it's own, I got two bottles cheap, one for frankening with and the other to use under glitters. I finally got it out to use as a layering polish during Christmas, and decided that it actually deserved a post of it's own. This was three coats. As far as I'm concerned it has a nightmare formula, it's drying as soon as it's on your nail and it's really thick, it's streaky as hell for the first two coats, but at least a thickish third coat sorts that out. Painting my nails white is almost as tricky as black, trying to not make a mess and get nice lines is important as it really shows up if it's messy, although I never do clean up so neat lines are more important. Well, even though it was a pain to apply I have completely fallen in love with it, it's unusal and probably a polish only for the brave, there's something edgy and cool about it, if you want people to look at your nails this is the polish for you. It dries to a really nice glossy finish, didn't bubble even though I put it on quite thick, and it got the thumbs up from my boyfriend who thought it was pretty cool. 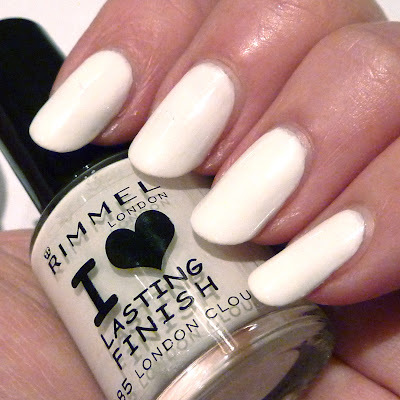 So that's my rambling thoughts on Rimmels London Clouds, if you like it, it should be easy enough to get and it'll be cheap, although I think it's now discountinued so ebay or amazon might be your best bet. What do you think of white nails, too much like Tipp-ex, or too cool for school?